Editor's note: A diagnosed schizophrenic convicted of killing eight people in Florida in the late 1970s is awaiting word as to whether his execution will go forward. John Ferguson had been scheduled to be executed Tuesday at 6 p.m. ET at the Florida State Prison, but a district court has granted him a stay. Read below for updates. [Updated at 11:30 p.m. ET] There will be no execution of John Ferguson Tuesday night. The U.S. Supreme Court denied a last-second attempt by state authorities to allow the lethal injection of the Florida death row inmate to proceed as scheduled. [Updated at 9:40 p.m. ET] The fate of a death row inmate in Florida is in the hands of the U.S. Supreme Court for a second time Tuesday, after a frantic day of appeals from lawyers for John Ferguson. In the latest legal move, Florida officials asked the justices to allow the lethal injection to proceed as scheduled, after a federal appeals court in Atlanta blocked the execution from taking place. The Supreme Court is expected to issue an order sometime before midnight. The high court earlier in the day had allowed corrections officials to go ahead with the capital punishment, but Ferguson's legal team went back and asked the appeals court to intervene. For now he remains on death row. Florida officials said Ferguson was being readied for the procedure when notified of the latest appeal. [Updated at 8:50 p.m. ET]The 11th Circuit U.S. Court of Appeals in Atlanta has issued a stay of execution, so the state of Florida has petitioned the U.S. Supreme Court to overturn the decision. [Updated at 7:26 p.m. ET] The U.S. Supreme Court has denied all three of Ferguson's appeals. However, a new appeal has been filed at the 11th Circuit U.S. Court of Appeals in Atlanta, said Jo Ellyn Rackleff, press secretary with the Florida Department of Corrections. Ferguson's execution had been scheduled for 6 p.m. ET. Rackleff said her department is waiting to learn whether the execution will go forward today. Ferguson had no visitors today, Rackleff said. In anticipation of the execution, he had a "last meal" of a country fried sandwich and sweet tea, she said. The 11th Circuit court is the same court that lifted a stay of execution granted by a lower federal court. The lower court had granted the stay because of concerns about Ferguson's mental capacities. [Updated at 5:29 p.m. ET] The U.S. Supreme Court has denied two of Ferguson's three appeals seeking stays of execution. We're still awaiting the decision on the third. [Updated at 4:08 p.m. ET] It looks like all of the appropriate briefs have been filed for the Supreme Court to consider John Ferguson's case, CNN Supreme Court Producer Bill Mears reports. The decision should come in the next few hours. [Updated at 1:25 p.m. ET] Laurel Bellows, the president of the American Bar Association, who rarely comments on upcoming executions, said she was "alarmed" by the John Ferguson case. Ferguson, scheduled to die tonight in Florida, has been diagnosed as a schizophrenic. "The American Bar Association is alarmed that Florida is poised to execute John Ferguson, a man diagnosed as severely mentally ill for more than 40 years, before the constitutionality of his execution is fully evaluated. Although a district court evidentiary hearing regarding Ferguson's competency is scheduled for Friday, that could be too late: His execution could occur as soon as today. A federal trial judge had stayed Ferguson’s execution and ordered the hearing to afford 'full, reflective consideration' of Ferguson’s constitutional claims; however, that stay has now been lifted by the court of appeals. In the interest of justice, it is imperative that Ferguson’s execution be again stayed until there is an opportunity for the federal courts to fully review his insanity claims on the merits and thus ensure that his execution will be constitutional. To do otherwise would be to risk a terrible miscarriage of justice — one that can never be undone." [Posted at 10:00 a.m. ET] The attorney for a Florida man convicted of killing eight people asked the U.S. Supreme Court Tuesday for an emergency stay of execution, he told CNN. 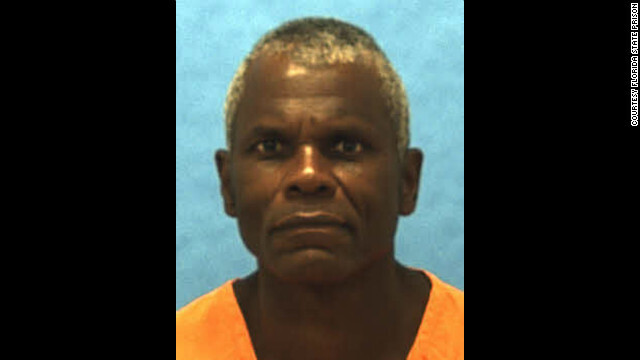 John Ferguson, a diagnosed schizophrenic, is on death row for the murders in Hialeah and Carol City, Florida, in the late 1970s. He was scheduled to be executed Tuesday at 6 p.m. ET at the Florida State Prison. The Supreme Court "has said it’s a ‘miserable spectacle’ to execute the insane," Chris Handman, the Washington D.C.-based attorney for Ferguson, told CNN. “We think the court should intervene to stop that execution from going forward today." Handman said a court found that Ferguson was mentally ill and had delusions which caused him to think he is the "Prince of God." A stay had been granted by a federal district court because of concerns about his mental capacities but that ruling was reversed by an appeals court. "We think there are substantial constitutional questions here that will merit the Supreme Court of the United States to honor the stay of execution," Handman said. "We hope to hear from the Supreme Court in the next few hours." In the meantime, officials at the prison in Starke, Florida, will go ahead with preparations for the execution, including fixing Ferguson's last meal, Misty Cash with the Florida Department of Corrections told CNN. Who are we to decide who lives and who dies. Who is the one who thinks they are so divie they can chose when to kill someone. If someone murmured me I will would not want them to die. They should be punished and I in spirit would eventually forgive them. I am not God and will never decide when to kill someone no matter what the crime committed was. He should have been executed back when we were only using old sparky!